Now that it is summer, it is the perfect time to work in the garage where the afternoon temperatures exceed 100 degrees. OK... maybe not the perfect time. The garage is just where I happen to be, at this particular time, on my to-do list. 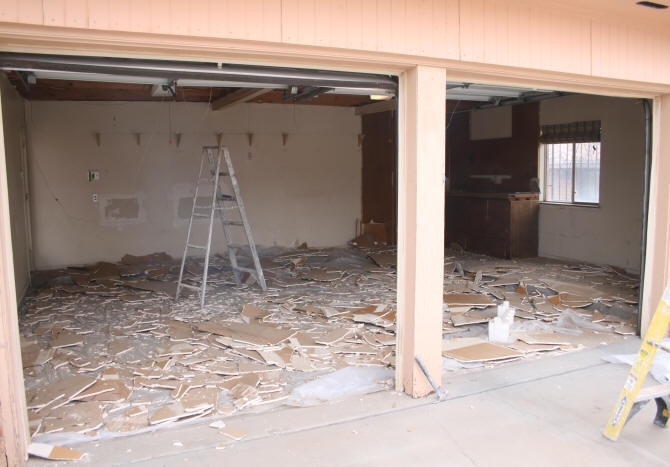 When the Raising the Roof project began, which involved tearing off the garage roof, I moved a lot of the stuff stored in the garage, into the house. Before I can work on projects inside of the house, I need to get the stuff back into the garage. Before I can do this, I need to build a storage closet in the garage to put everything in. - Paint walls, etc. to brighten up the space. - Put some kind of non-skid surface treatment on cement floor to prevent slipping when wet. 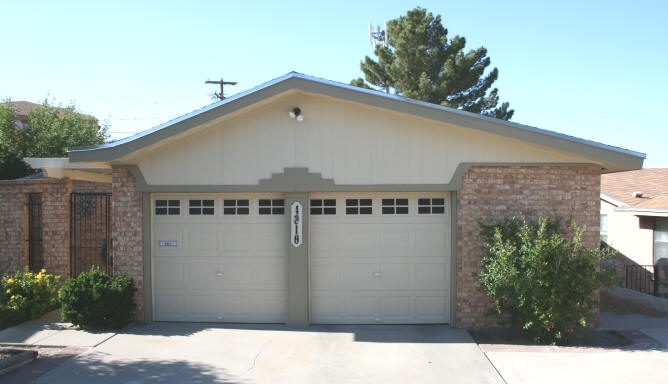 The garage is located in front of the house and had a near flat roof when we bought the house. 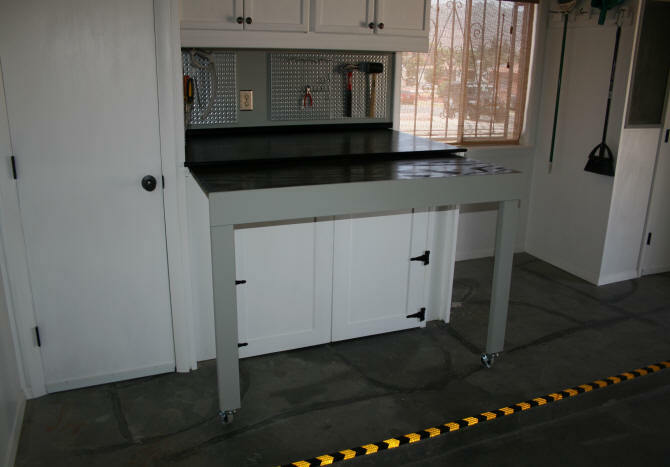 The garage fits two vehicles and has an added raised cement section for storage or a workbench. 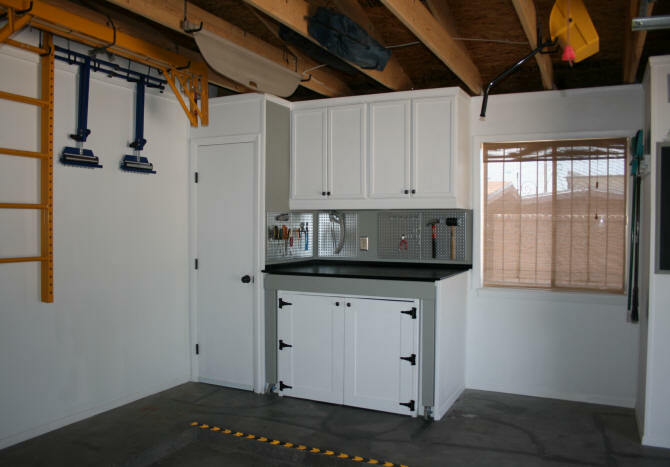 The garage was finished with sheetrock ceilings (unpainted) and walls (painted). 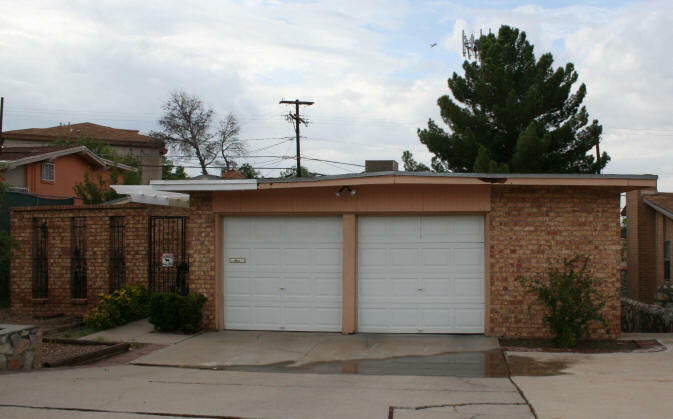 The garage is a separate structure attached to the house by a section of roof. The flat garage roof was replaced with a higher roof in 2015. The exterior of the garage was also given a facelift at the time. 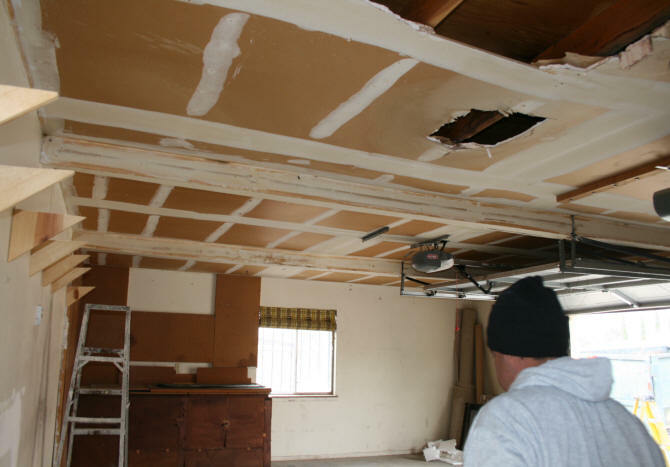 When the old roof came off, the sheet rock ceiling was also removed. Then the new roof was put in place. 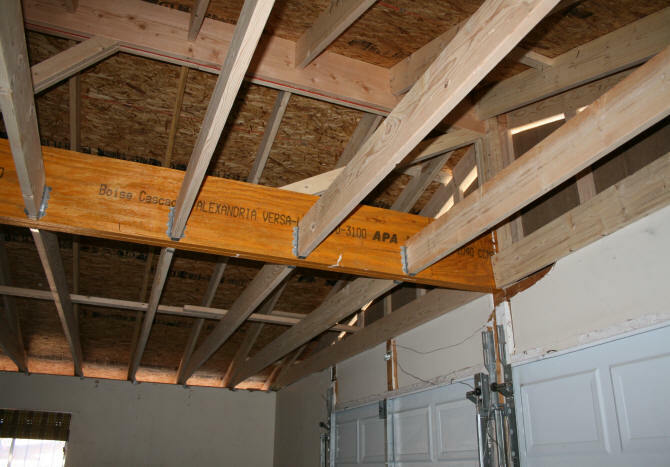 In order to attach the new roof frame to the garage walls, some of the sheetrock on the walls needed to be removed so the roof clips could be installed where the wall framing was. 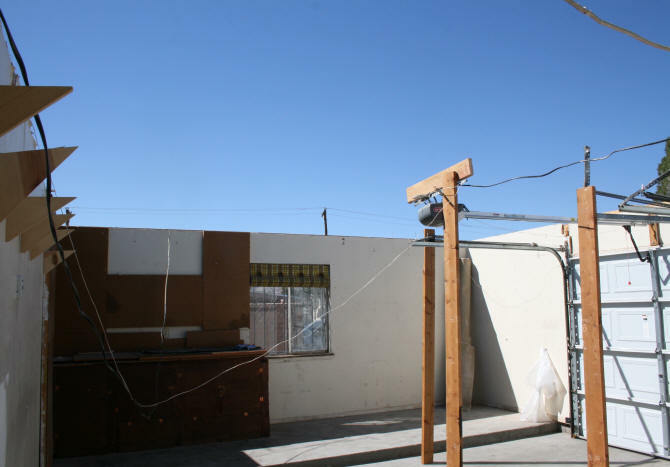 The contractor offered to repair the damage and put a new ceiling in. I however did not want the new roof framing covered. I wanted it exposed, so that the space could be used for storage. The damage along the walls I would repair myself. New roof in place. Soffit boards outside not yet installed, thus all of the light coming in around edges. Note damage to sheet rock walls along top edge. So now, a year after construction of the new roof, I am ready to tackle the inside of the garage. This work will be done in stages and in a particular order. For example, before I can build the closet in the corner, I need to move, use, or get rid of the lumber and stuff I have stored there. Hmmm. Let's use some of the stuff I had stored in the corner. I had two wire shelves that had originally been in our laundry room. I installed both wire shelves on the rafters. I will use this space to store 8' long pieces of trim, moulding, or flashing. Items that are not too heavy. What about the shorter pieces of trim and moulding? Using some left over 2" x 2", I built a hanging shelf screwed into the rafters. So far so good. I have not needed to go to the hardware store to buy anything. 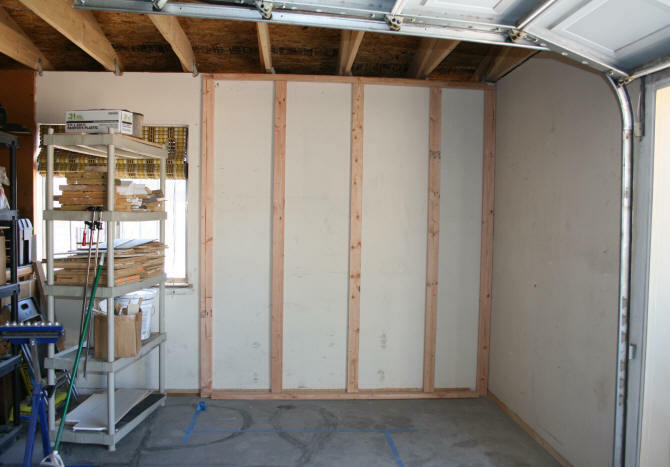 Then I worked on the long wall that is visible when the garage doors are open. 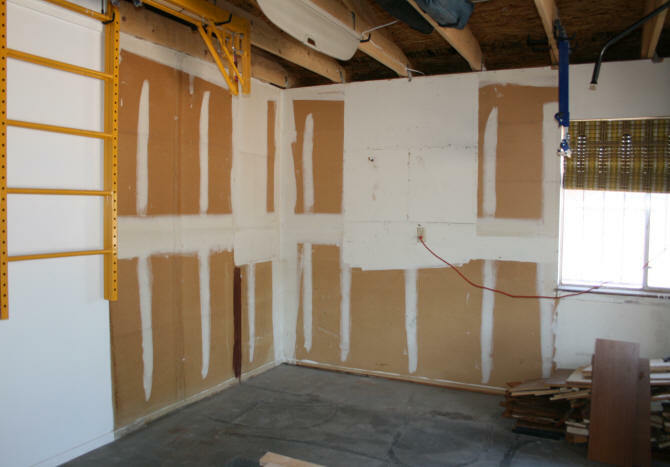 I had previously patched two large holes that were in the sheetrock but had not painted them. There were also two small areas at the top of the wall to repair. There was a gap between the new frame and the wall that I wanted to install some trim. There were also about 100 holes on the wall to fill before painting. There was also the corner section above the door. This area still showed some of the older roofing that connects to the roof over the house front entrance. I just wanted to hide this transition area a little. Corner section that still shows rafters from roof section over front entrance of house. I repaired the sheetrock at the top of the wall. I had saved the old trim board from the front entrance and re-purposed here along the top of the wall right under the rafter which covered the gap. After I filled the 100 holes, scraped, and sanded down some rough spots, I then slapped on two coats of white primer/paint. 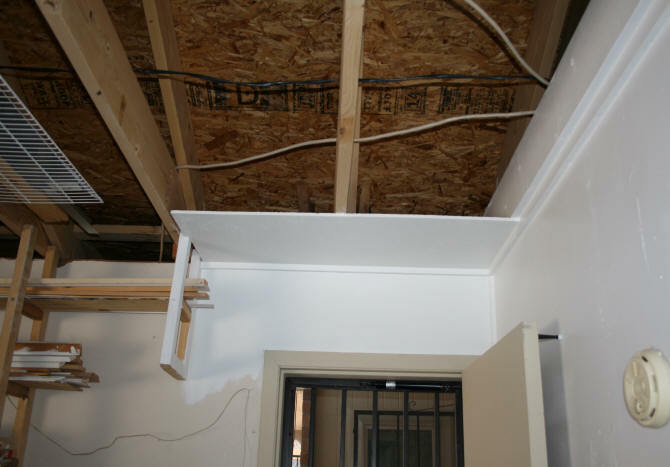 I used a scrap piece of roof sheathing to create a mini ceiling over the door. The scrap sheathing was not big enough to go over to the next rafter on the left where I would have wanted it to. It helps cover up some of the ugliness of this corner, so it will do for now. I have a scrap piece of fascia that I may use to attach to the end vertically to box up the corner. I ordered some rafter hooks online and hung up some stuff along the freshly painted wall. All that was left in the corner were two plastic shelves, which I easily dragged away from the corner. Now I am ready to build a closet in this corner. Off to the hardware store...... after I get my SUV back from the repair shop. The little white car rental pictured above is worthless for a lumber run. June 11, 2016. June 13, 2016 - While I am waiting for my SUV to be repaired, I prepared my garage closet plans. I will be buying the framing materials first. After the frame is up, I will make the final measurements for the walls of the closet. 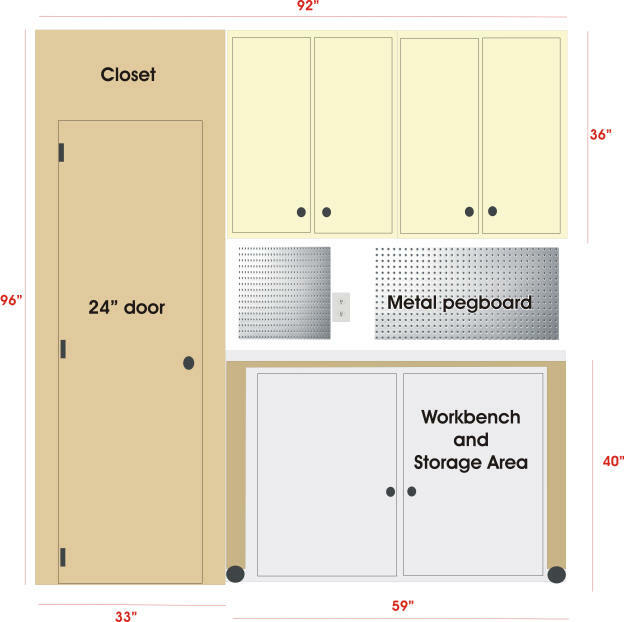 These measurements for the plywood walls, need to be exact, because I will be having the hardware store cut the plywood to size so I can fit it in my SUV. Also, there is no way I can fit all of the 2x4's AND the plywood in my SUV at one time. The floor plan for the closet is below. When creating this floor plan, I had several things to consider. 1) It is "L" shaped because I wanted to maximize the available space. 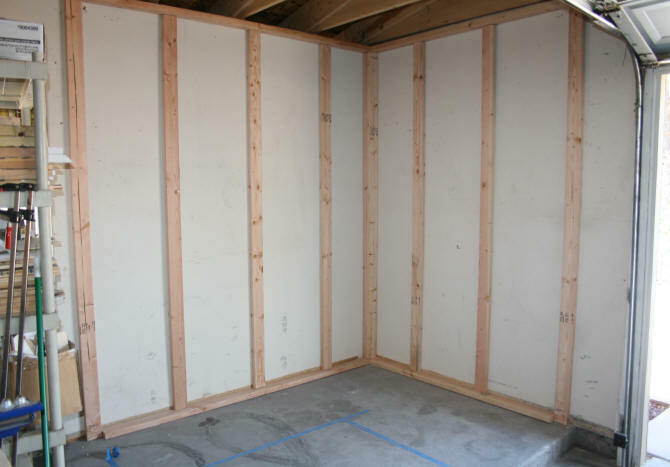 If I just made a rectangle shaped closet against either wall, I would not have as large of an enclosed space. If I made a huge square, going to the edge of the cement ledge, it would block a car door. The 38" along the edge of cement ledge will not block any car doors. 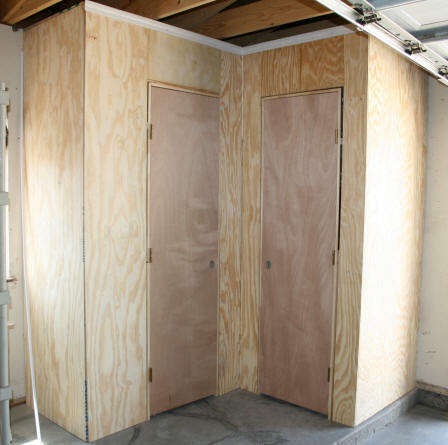 2) There are two doors because I hate squeezing into tight closets. Both doors will of course open to the outside. When both doors are open, objects can be moved easily to either side. Both openings will also allow access to the shelves in the corner. 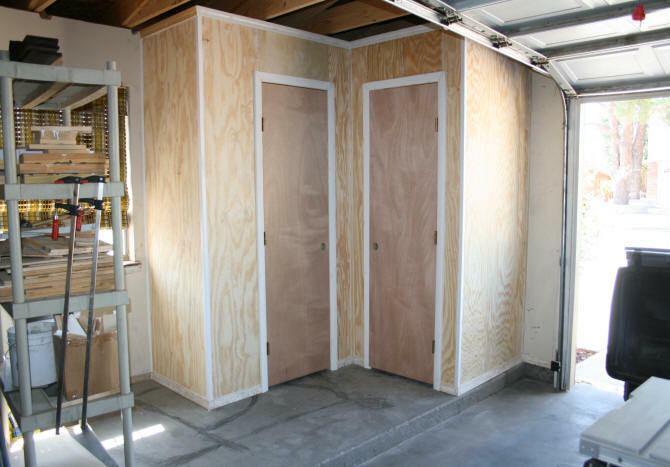 Both doors will also allow enough room to go in and out on top of the cement ledge. If the doors opened too close to the ledge, you would have to be careful of falling off the ledge when backing out of the closet. 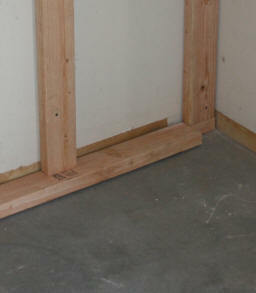 1) Create the frame for the window wall and then attach it to the existing wall studs. 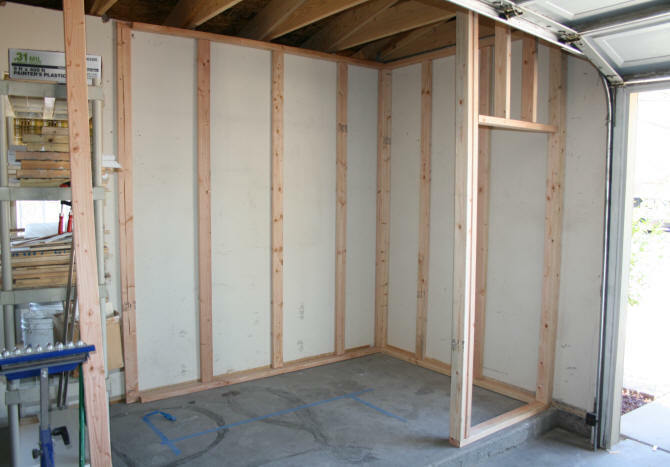 2) Create the frame for the shorter wall and attach it to the frame against the window wall in the corner and to the wall studs in the shorter wall. 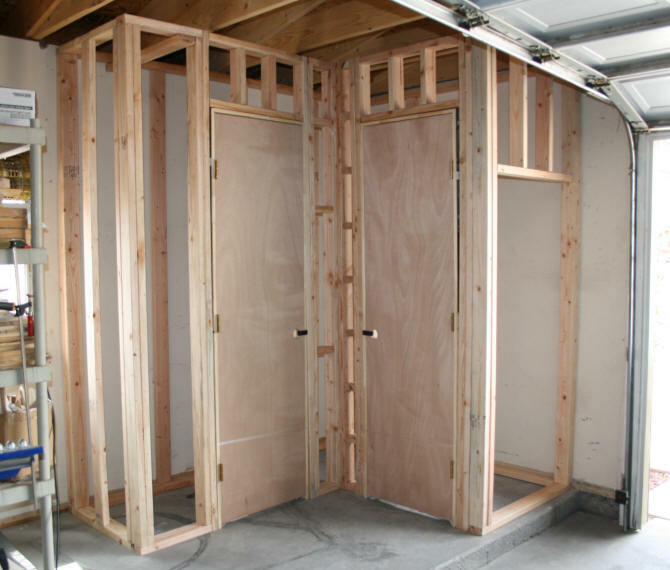 5) Build wall frames for the door walls. June 16, 2016 - Finally got my SUV back yesterday afternoon. Made my lumber run to the hardware store to pick-up the 2 x 4's I needed. Yes, you can fit 37 - 8 feet long 2 x 4's in the back of a Mitsubishi Montero Sport, if you remove the passenger side head rest. Probably could have fit 10 more. After removing the base board moulding from the wall, I was ready to begin. I started with the longer more difficult 92" long section. I cut two 92" pieces for the top and bottom of the frame. I then cut out the notches on the corners where the adjoining frame pieces will connect. I pre-drilled my nail holes for the vertical pieces on the top and bottom pieces. I then cut five 2 x 4's 93" long. I laid the frame flat on the ground and nailed all the vertical pieces into the top and bottom pieces with 2 1/2" nails. The frame was then lifted up and dragged into place up against the wall. The frame was nailed to the wall where the studs are. And in case anyone is wondering....the studs in the existing wall are 24" apart, not 18". 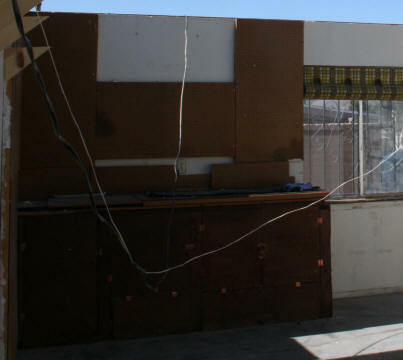 The height of the wall from the floor to the top of the sheetrock was 96 1/2". I decided to make the height of the closet framing 96". I wanted to leave enough room on the top to attach a plywood ceiling. Why bother with a ceiling you ask? I want to make this closet somewhat air tight. I want to minimize the amount of dust getting in the closet. 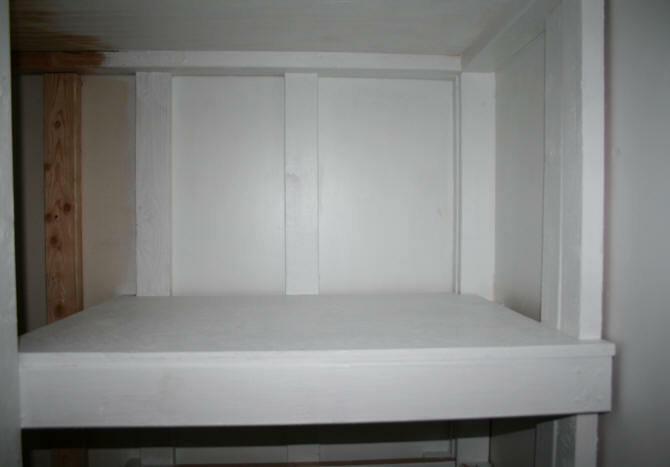 Also the top of the closet can be used to store items. The top and bottom 2 x 4's nicely covered up the damaged sheetrock at the top and the gap where the base boards were removed. June 17, 2016 - Today I completed the 70" and 38" sections of the closet frame. 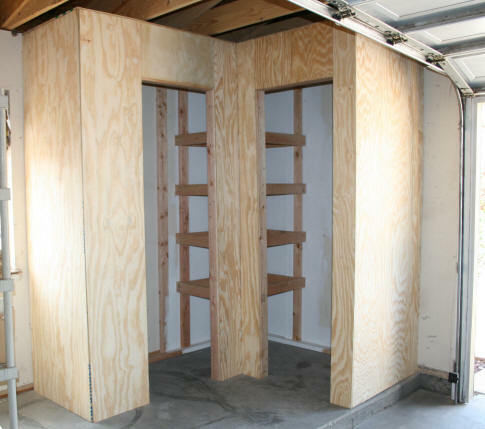 I am building this closet a little a day. With temperatures in the 100's, it is not easy. The 70" section slid right into the corner notch I made on the 92" section of frame. This now keeps it firmly in place, along with the nails. I then built the 38" section. For this piece I deviated from making a normally frame. The big gap with no 2 x 4's is going to be used to store my scaffolding platforms. I want the platforms to sit on top of the bottom 2 x 4 and lay flush against the inner wall. There will be a piece of wood holding the platforms firmly against the wall. This way these platforms will be securely out of the way and not falling over like they do now. Once the closet is done, I'll include a photo of it. June 18, 2016 - Started working after I made a 6:00 am run to the hardware store to pick-up the two pre-hung doors I needed. When I finished for the day at 1:30 pm, it was already 103 degrees outside. I first completed the 30" wall and 16" of the 54" wall. 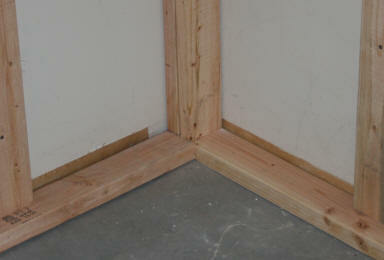 To help stabilize the frame in this section, I attached a 2 x 4 at the top of the frame. 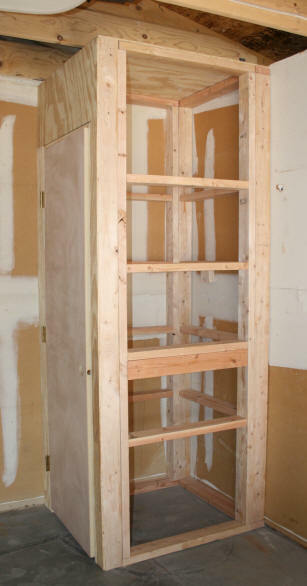 Once the frame is complete, and the plywood walls are on, this closet will be solid. Until then, the pieces slide around a little if you hit them hard enough. You will also notice that I did not attach any horizontal pieces between the vertical 2 x 4's. This is because I will be inserting a modular shelving system in this space. Not sure exactly how I am doing this yet. Just concentrating on getting the frame up first. I had just enough energy to complete one door frame section. I then slid one of the doors in place to make sure it fit. It did. 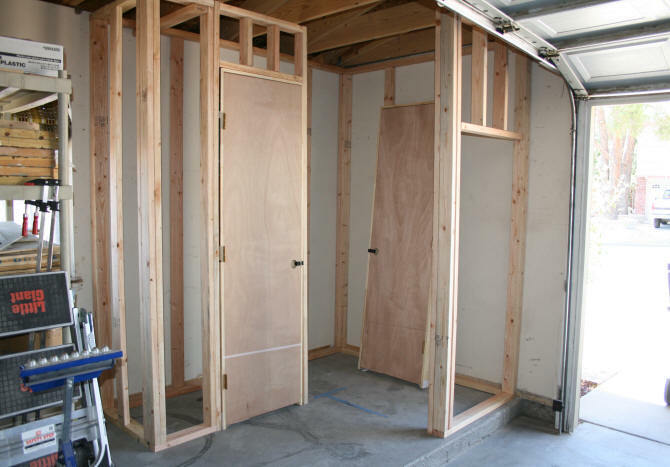 The doors will not be installed until the entire frame is completed and the walls and ceiling are in place. 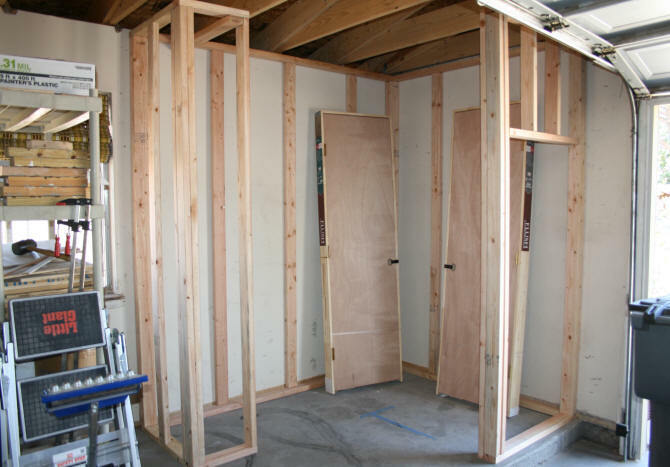 June 19, 2016 - I managed to finish the framing of the closet walls today. The small section of frame to the left of the right door has eight horizontal pieces. It just happened that the numerous 3" scrap pieces I had, fit in this gap. I spaced them 12" apart. What normally is a dead space is now an area where I can store 8 cans of spray paint or other aerosol product. This was not something I planned for in my initial design. It was just something I thought of on the fly. I am now ready for the outer walls. 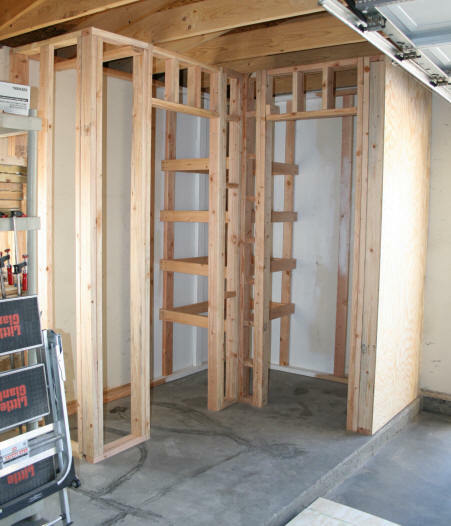 But before I put the walls on, I am going to install the frame for the heavy duty large shelving in the large corner of the closet. 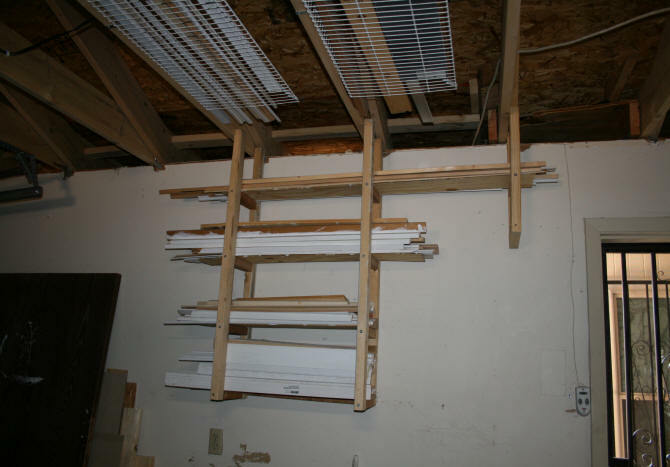 The frame for this shelving will be attached to the frame walls. 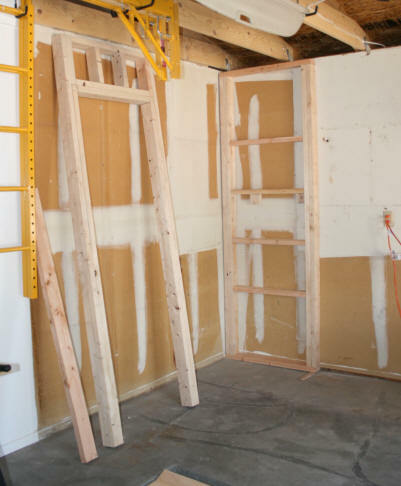 This shelf framing will help stabilize the outer closet walls. There will be 4 shelves measuring approximately 35" x 27". These shelves will be for large heavy bulky items. Some of you may be wondering why I have not anchored the frame onto the floor. Which would be the most logical thing to do, to keep the frame from sliding around. Simply....I don't want to try and drill through the concrete. The closet in the man cave (see this here), has stayed put, just fine, after 3 years without anchoring it to the cement floor. June 21, 2016 - After making yet another 6:00 am hardware store run, I got to work on making the frame for the inside corner heavy duty shelving. Before nailing in the framing for the corner shelf, I painted the inside corner. Why? Look at the photo to the right. To stand inside and paint this area I have to climb over the top or crawl in underneath. Not easy if you are almost 60. Yes, I still need to paint the shelf frame, but there will be less to paint now. I will be buying 3/4" plywood for these shelves. The shelves will be supported on all four sides by the framing. This section of the closet is now very rigid. No more sliding around on the floor. And yes, at almost 200 lbs, I would feel safe climbing up the shelf framing. I nailed up the plywood on 38" wall before I finished for the day, just to get it out of the way. June 22, 2016 - Plywood walls placed up on outside of walls. For the areas on top of the door openings, I used scrap lumber I had laying around. The ceiling has one long piece of plywood running along the 92" wall, 30" wide. For the remaining area above where the right door is, I had a half sheet of siding left over from my siding project. I cut a piece 38" x 40" to cover this section of the closet ceiling. 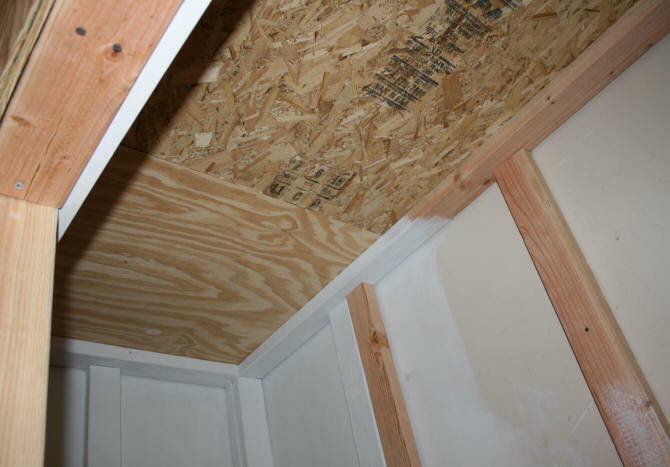 I placed it siding side up, this way the ceiling just looks like I used sheathing. You may wonder how I nailed the ceiling on. Let's just say it was done with great difficulty. Yes, I hit my head several times on the roof rafters climbing up on the ladder. If I did not use the scrap lumber I had, I would have needed a fourth piece of plywood for this project. 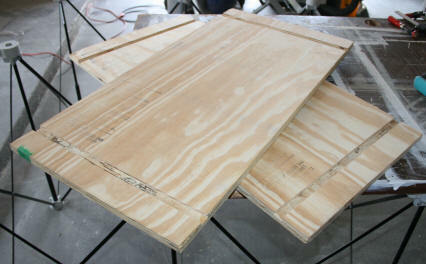 So if you are following my plans, using my dimensions, you will need four pieces of plywood for the walls and ceilings. June 23, 2016 - Today was door hanging day. Managed to get both doors hung without too many problems. The doors will be removed from the hinges for painting. I went through all of my moulding to see what I had. I recycled some moulding and used it at the top. I will need to visit the hardware store again to pick-up what I don't have. 1) Along top edge and around doors. 3) Corner moulding and quarter rounds for edges and inside corner. No moulding on the inside of the closet.. I will also be buying 3/4" plywood for the shelves. June 24, 2016 - Attached all of the moulding to the outside of the closet. Did some caulking and nail hole filling. After I remove the doors and hinges, the outside is ready to paint. Doors finally hung. They actually close without sticking!! Trim work completed on the outside of closet. Ready for paint. June 25, 2016 - Today I cut and started painting the shelves for the heavy duty shelf located in the inside corner. Each of the four pieces of wood are 38" x 27". I then cut out some tabs and notches to make the shelves a little more custom fitting. On the inside edges there is a one inch gap. This was intended. I did not see the need to make these shelves go all away against the wall when they would just be used for large bulky items. The top shelf was nailed securely in place. Safer this way. Too dangerous to be pulling something off the shelf and the shelf tilts and everything lands on top of you. I will probably nail the other three shelves in place also. This shelf was not designed to be modular. July 10, 2016 - I completed the garage storage closet on June 29, 2016, which included all of the painting. Moving day was on June 30, 2016. Which means, I moved everything off of the two plastic storage shelves, into the closet so that I could get rid of the plastic shelving. Garage storage closet complete. French cleat hanging on longer walls, chalk board painted on, and hung license plates for some garage chic. Before completion, I finished the shelving in the corner of the closet on the left side. 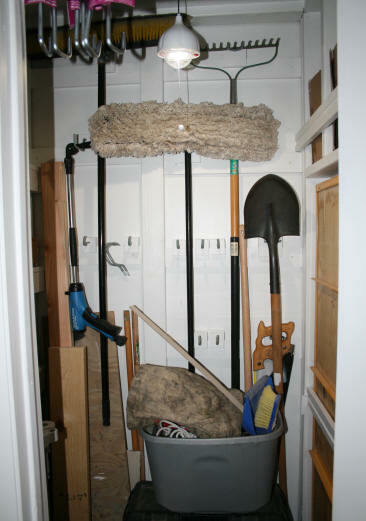 I also added some French cleat sections for hanging the larger items like brooms, shovels, etc. Shiny brass hinges that came with the pre-hung doors were removed and spray painted with oil rubbed bronze. The door knobs are the same as the inside of the house. I had the two knobs on-hand already. They do lock if needed. 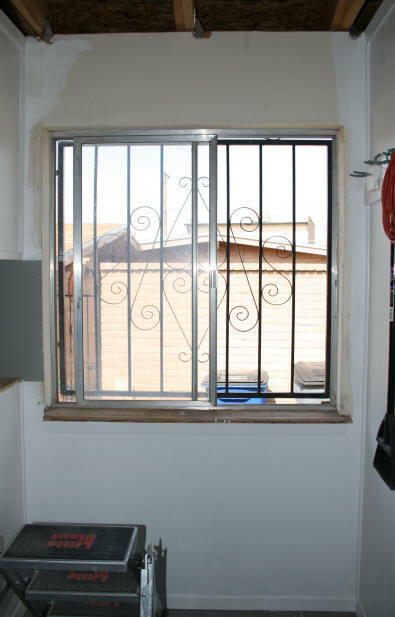 When locked, this will prevent a quick crime of opportunity if the garage doors are open and some petty thief is walking by. Here in El Paso, you have to be on constant alert. If something is not locked down, it will just walk away. While working in my garage with the doors open, I have thwarted a few of these possible thefts by being somewhere where I could not be readily seen. One idiot, whom I have never seen before, actually started rambling about wanting to borrow a cup of paint thinner when I noticed him. Really??? I just waved the paint brush I had in my hand at the time and said, "Sorry, I am only using latex based paint, no thinner." If I had not been there, something would have been ripped off. The door locks will also keep out small children. However, for a burglar with time on their hands, the locks are useless if the burglar knows how to remove the door hinge pins. License plates were mounted to scrap pieces of thin plywood that I painted gray. Just a decorative touch. But.... the plates hide some of the plywood seams above the doors. I created some "L" shaped brackets from some scrap wood to secure the wood that holds the scaffolding platforms in place in the nook I created for them when I built the closet along the 38" wall. Because the scaffolding platforms have metal edges, they need to be held in place. If not, the metal just slides and the shelves fall down. Chalkboard paint was added to a section of the outside wall of the closet and was framed with some painted scrap polystyrene moulding. 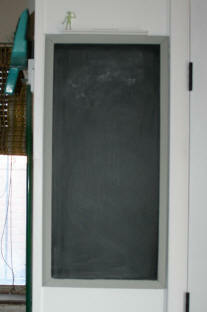 Why a chalkboard? I am always looking for a pen and paper to do a quick calculation. Then I loose the paper I do the calculation on. Also, I will use it to jot down items I need to buy or run out of. Chalk tray was placed at the top of the board. Also made with a glued-on piece of moulding. The closet was made to be almost air tight, to keep out dust. Except for the space under the doors which I will eventually seal with some weather stripping. Which means....it is pitch black inside when the doors are closed. During the day, you can see ok inside. During the night, forget about it. I needed to install some lights. 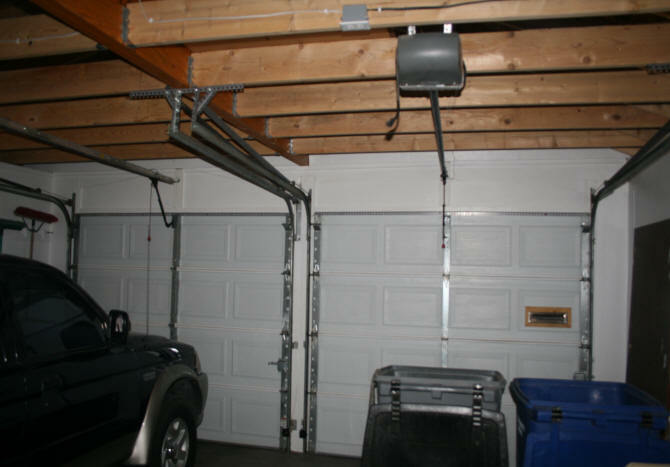 For this garage, adding more electrical lights is not an option. Just running my table saw can trip the circuit breaker. I was not about to add more of an electrical load to this space. I thought about battery operated lights but they always are "accidentally" left on and you have to keep changing the batteries. I opted for lights that have solar charging batteries. 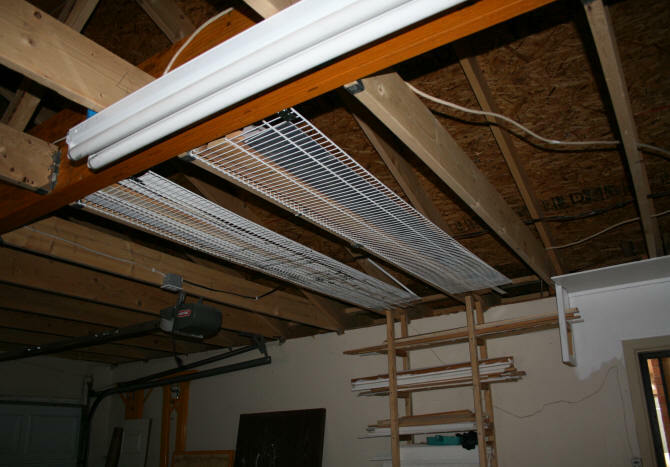 With the open roof framing, it was easy to run the light cords to the solar panels through the roof soffit vent. The panels were mounted on the west side of the garage roof fascia. The sun hits the panels for at least 5 hours a day which is more than enough for a solar light that is just used for brief periods. If it is accidentally left on over night, it just recharges again when the sun is out. After moving everything from the plastic shelving into the L-shaped closet.... I then had to move everything that was inside the old workbench storage area. Which means, my new L-shaped closet is now packed full.....temporarily. 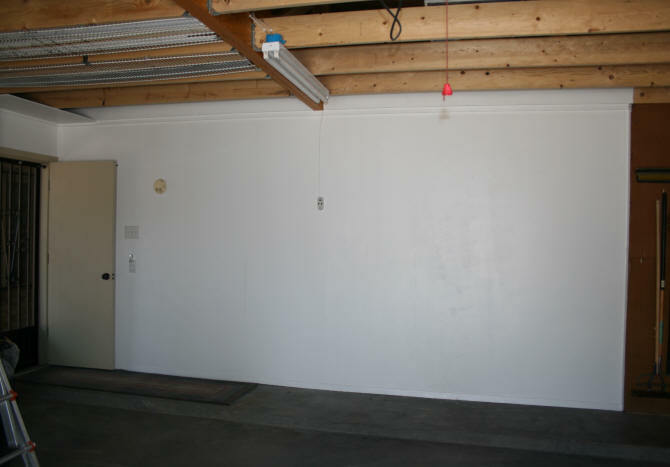 The monstrosity in the other corner of this garage wall is going to be torn out and a new storage and workbench area will be built. The old workbench in this corner is too high, the cabinet doors are falling off, there are nails sticking out everywhere from it, the cardboard pegboards are too wimpy, to use the bottom cabinet area you have to lay on the ground just to look inside. Oh, and can we all agree...it is just plain ugly. 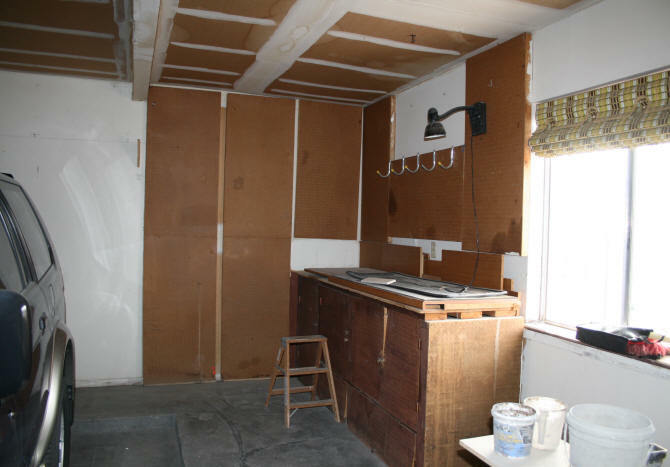 The old work bench, cabinets, and pegboard sections were then torn off. Most of it came off easily. 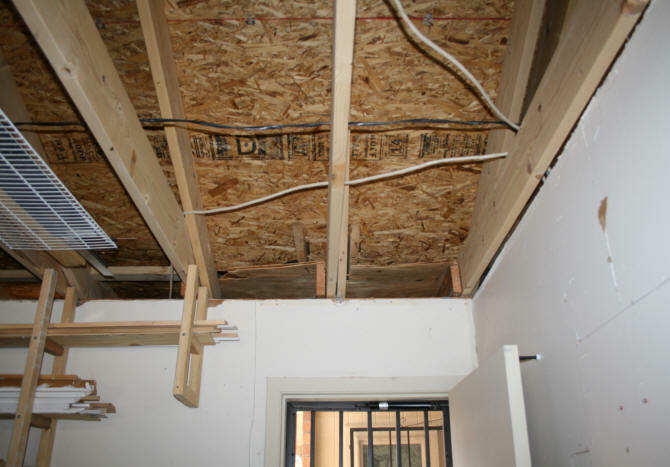 Nothing was attached to the studs and fortunately there was not much damage to the sheetrock behind everything. A few holes which are easy to fill. All of the large wood pieces were cut down to smaller pieces so that they can fit in our trash bin over the next couple of collection cycles. Old workbench/cabinet and pegboards torn out. Lumber trash pile is what remains. New storage and workbench will be built in this corner. July 11, 2016 - Since it it still in 100's outside, I will spend some time indoors planning the new workbench/storage area. 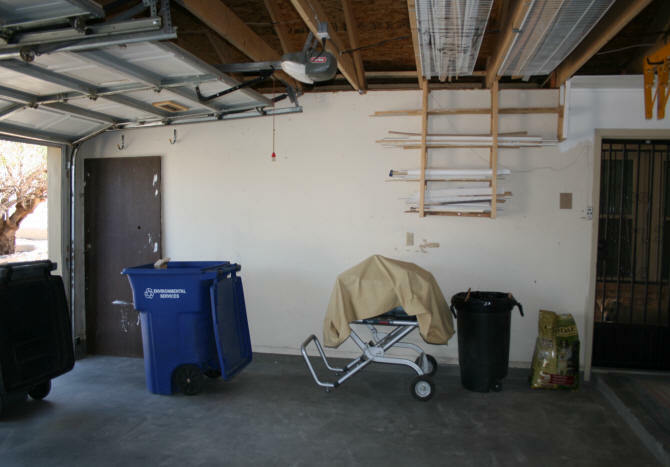 This corner of the garage is the same size as the space I built the L-shaped closet. 72" from the wall to the cement ledge. 96" between the window and corner. I am leaving 4" to the left of the window as I did with the L-shaped closet. So I actually have 92" to work with. 1) I want to be able to continuously walk along the cement ledge. So I will not be building anything too close to the edge that will prevent this. 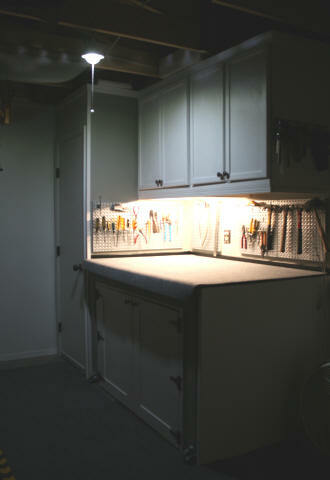 2) Space above the older workbench was wasted. It was hard to pegboard any item above 6'. Which means there was 2' of higher space that needs to be utilized. A perfect place for hanging cabinets. 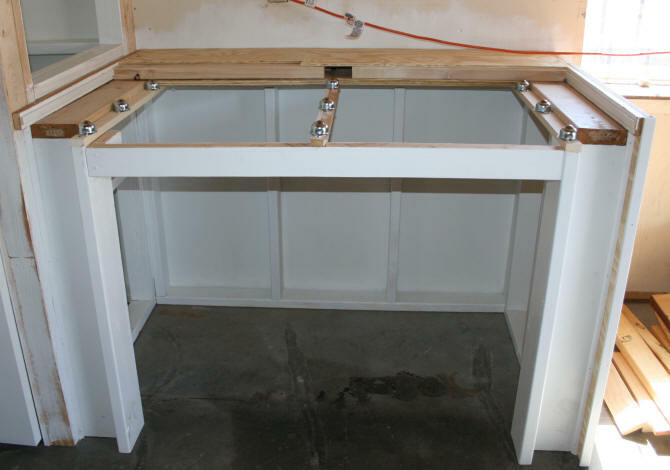 3) Storage underneath the workbench is still desired, but with a different purpose. A place where large bulky objects like the shop vacuum, can be rolled in. 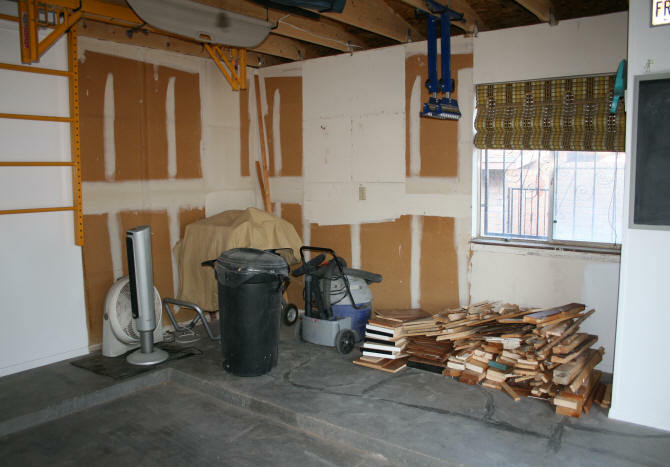 4) Overall storage of large bulky items is still needed. So an additional closet will be built. 5) The old workbench was small. I can make it bigger and have an extension to make it even larger when needed. I sat down with my graphic program and started doodling around with layout. 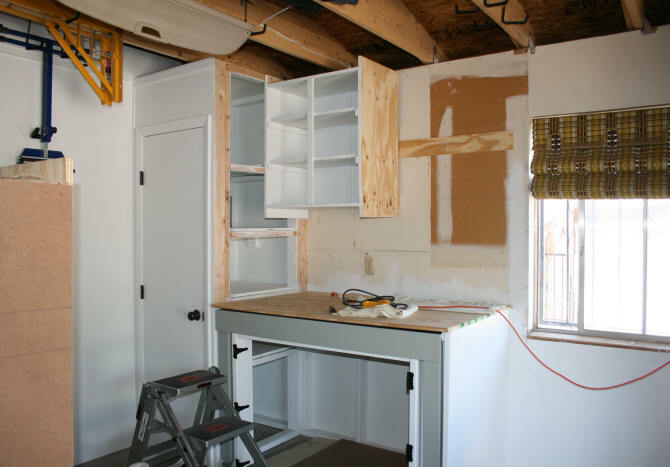 The plan consists of three separate sections: 1) the closet, 2) workbench, and 3) the hanging cabinets. For the closet, I wanted to use another 24" pre-hung door. 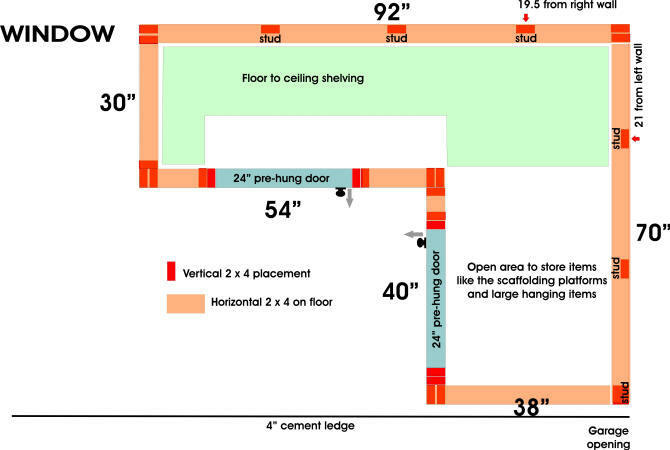 With the width of the pre-hung door and two 2 x4's to frame each side of the door, I calculated the width of the closet to be 33". Depending on how many decent 2 x 4's I can get, this measurement may vary a little. Regarding the 2 x 4's I get at the big box stores. Ha! Good luck finding straight ones. So when I say "decent" I mean a minimal amount of warping. I spend a lot of time picking out my lumber, sorting through all of the lousy pieces. I have had them bring out new pallets because what was currently on display was crud. With this in mind, the closet will be framed first. What remains from 92" will be the workbench width; 59" plus or minus. The depth of the closet will be 36". This will still allow me 36" of cement ledge to stand on while opening the closet. 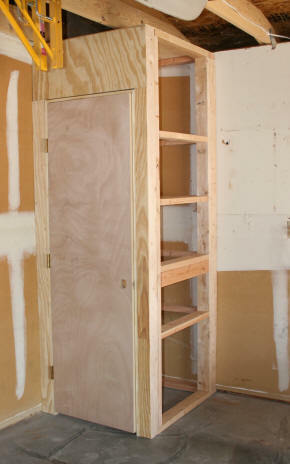 The horizontal framing of the closet will double as shelf supports. There will be four shelves inside the closet. The workbench will be a deep 36". I was going to make it a more standard 24" but realized the shop vac was longer than 24". I just want to roll the bloody thing in and close the door. I don't want to remove hoses or the handle. This shop vac is always in the way, no matter where I put it. I want it to have a home where it can stay put until I need it. The deeper workbench area will provide approx. 15 square feet of work space. One foot less than the old workbench surface. However, I plan to have an extension that will roll out, providing at least 10 more square feet of surface area. The roll out extension to the workbench is still being worked out in my head. I looked on the web for something similar to what I envisioned, but did not find anything. 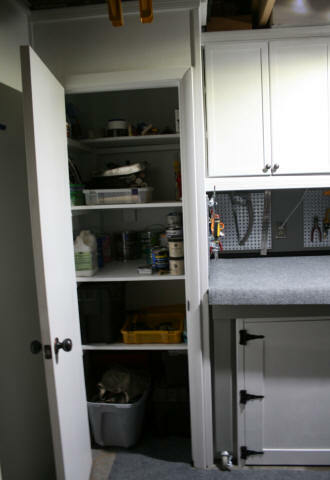 A folding extension would not work because it would cover the lower cabinet door. To get something out, you would have to lift the extension. 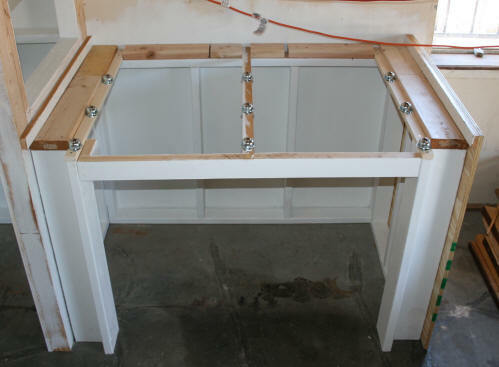 Basically, there will be a gap or pocket at the top of the frame of the workbench. The extension will be housed in there. When needed the extension will be pulled out of the pocket. 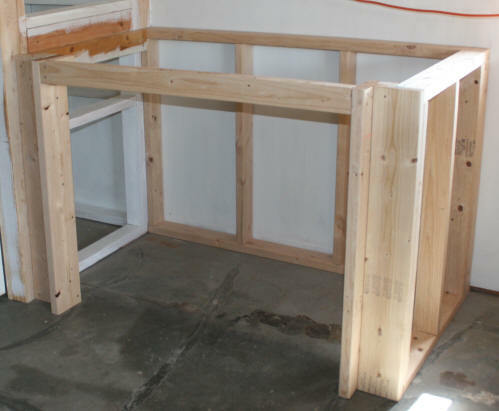 It will only need two legs because the workbench frame will support the extension on one side. For ease of movement, there will be locking casters on the two legs. Unlocked when not in use. The shelf will have conveyor ball transfers mounted on the frame which will allow the shelf to "roll" out easily instead of sliding along the wood frame. I guess I could line the frame with felt, so the wood pulls out easier. However, this only works well if the wood is smooth so it won't snag the felt every time. There is also wax, which will only collect dust over time. It is easier to screw about six of these ball bearings under the shelf and roll it out. The extension will have some kind of stop to keep it from being pulled all of the way out of the pocket. When I am working on this portion of the workbench, I will include enough photos so you know what I did. 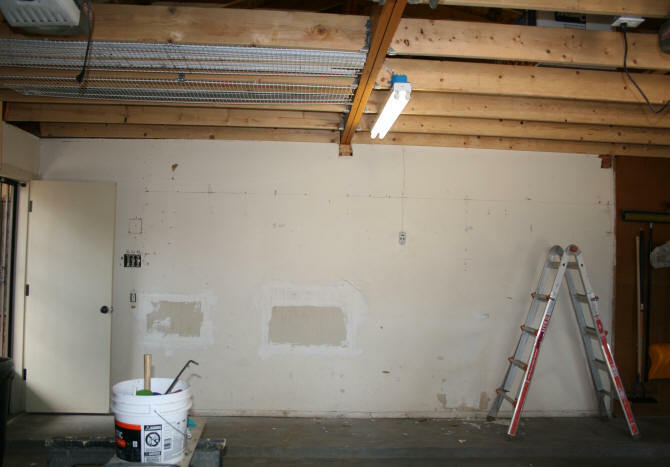 Some of the wall space around the workbench will be covered with metal pegboards. 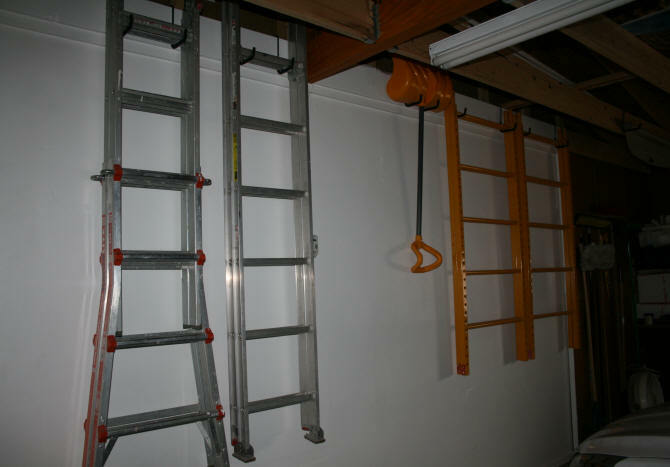 This will be used only for hanging the tools that are used frequently. Hammer, screw drivers, awl, etc. I prefer to keep most of my tools out of view in a closet or cabinet. July 17, 2016 - Went to the hardware store yesterday to pick-up the 2 x 4's and the pre-hung door for the closet section for this corner of the garage. After cleaning up the area and removing the baseboards, I was now ready to start building the closet frame. For this closet, I built the door frame section first. The reason for this is that the whole width of the closet is based on the door. I wanted to make it as narrow as possible. I butted the 2 x4's next to each other. By doing this, the frame measured 31-11/16" wide. With this measurement, I then made the back frame. The back frame was attached to a couple of studs in the wall. Oh!.....and the left wall is not square. It tilts outward going toward the top. So I needed to level the back frame before nailing it to the wall stud. This is all I did today. July 18, 2016 - I worked on the two side frames today. Because I did not put any spacers between the 2 x 4's around the door frame, I needed to remove a half inch off the vertical 2 x 4 on the side piece near the door. If I did not do this, the pre-hung door would not go in the frame correctly. After finishing the two side frames, I attached them to the back piece and then the door frame. 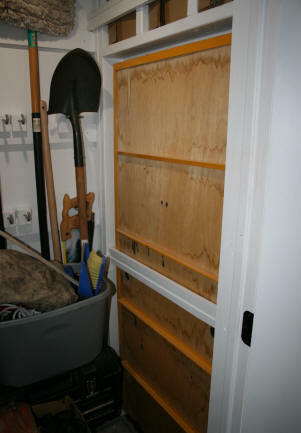 Using scrap pieces of plywood, I put a ceiling on the closet and covered the front of the closet. I then hung the door with no problems. 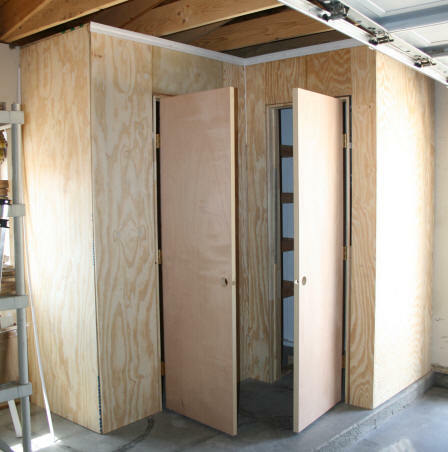 For the inside of the closet, I just need to cut four pieces of plywood for the shelves. The framing supplies the support for these shelves. 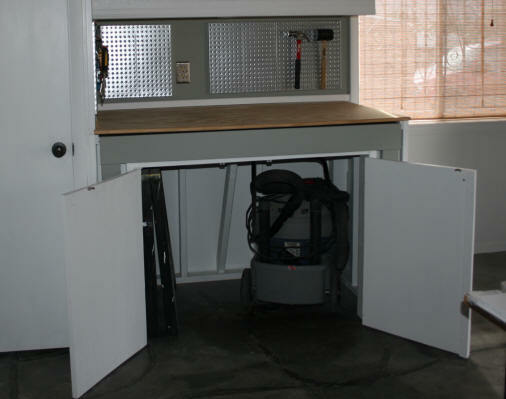 The right side of the closet will remain uncovered until the workbench is built. Under the second frame support on the right side I added an additional piece of wood. This wood will help support the workbench when I start to frame it. 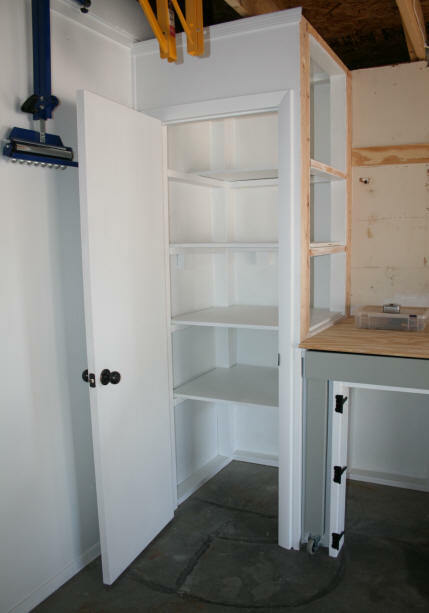 It will also attach the workbench to the closet. The center of the second side frame support was placed 40" from the floor. In case someone is wondering about the horizontal frame spacing, they are at the following measurements from the floor up: 24", 40", 56", and 72". I always leave more space for bottom and top storage areas. For the shelf that will be placed at the 72" position, it will be half the size of the others. If I made it all the way to the door frame, you would not be able to get much inside easily. I will need to make another trip to the hardware store before I can continue. July 22, 2016 - On the 19th and 20th, I did the "use everything I have on-hand game" to go as far as I could before I needed something from the hardware store. Going through the moulding I had on-hand, I added moulding along the top rafter against the wall where the pegboard used to be. I had some moulding for the top of the closet and around part of the door. With the remaining paint I had left over from the other closet, I did some painting. On the 21st, I made my hardware store run to pick-up the remaining wood I needed for this project and some hardware. 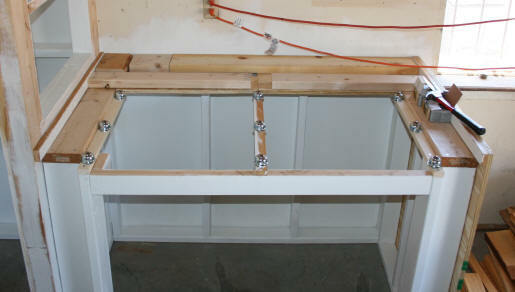 Today I worked on the bottom section of the frame for the workbench. I say bottom section because there will be 4 more inches added to the top. The outside corners are an "L" shape made with 2 x 6's. The legs of the roll out extension will be tucked in this area. I used three 2 x 6's on each corner. I cut notches in the 2 x 6's to fit the 2 x 4's on the sides. The height of this framing is 36". The open space underneath will be covered by a set of doors. No framing will go on the floor of this opening. This is the space to be used for roll-in items like the shop vac. I already rolled the shop vac into this space to make sure it fits. It does easily. The next step is to create the framework that will support the roll out extension. This frame will have the transfer support balls screwed on them. The roll out extension will then be placed on top of the balls. 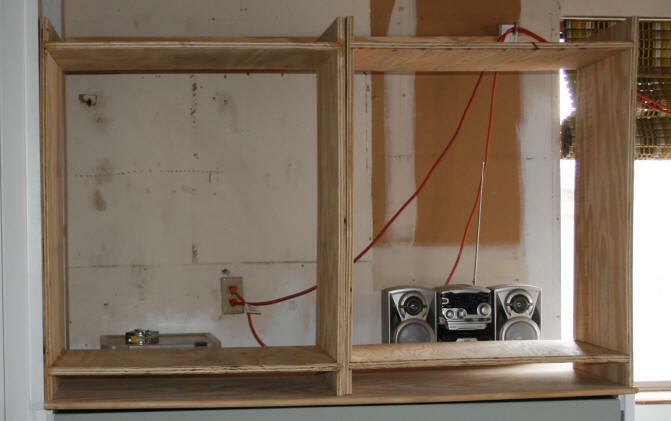 This extension will only be a piece of 3/4" plywood with two 2 x 4" legs attached. There will be a little bit of trim on the edge and a stop attached underneath to keep the extension from being pulled out all of the way. 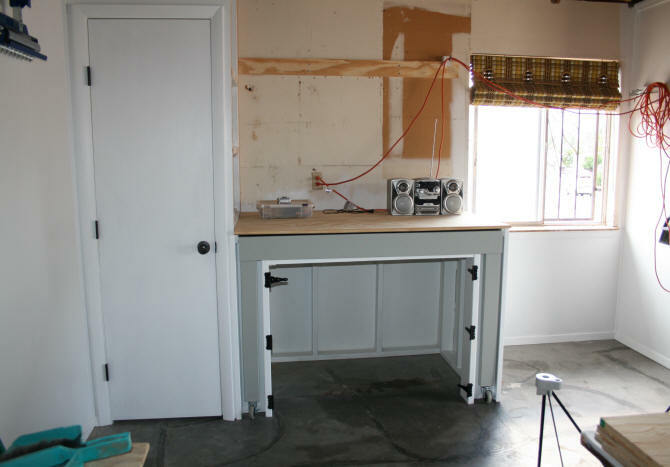 When the roll out is complete, the final workbench surface will be put in place on top. 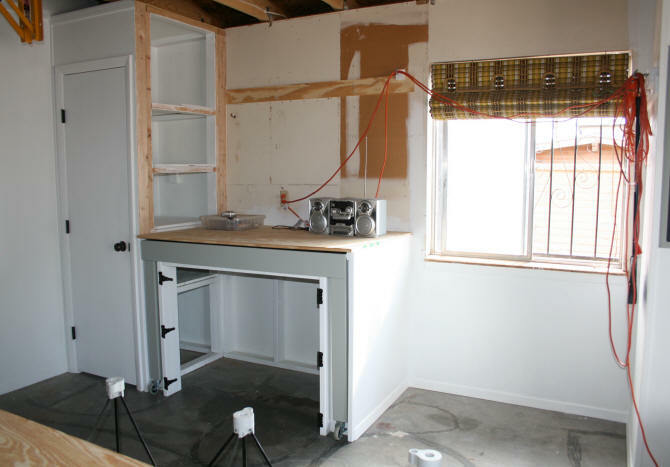 July 24, 2016 - The last couple of days have been spent figuring out the roll out extension for the workbench and building up the areas around where the extension's pocket will be. The back 12 inches of the workbench frame were built up with scrap lumber so the final overall height of the bench will be 40". The perfect height for my arthritic back. The roll out extension was made and the casters attached to the bottom of the two legs. It will now be removed to reinforce and paint it. Roll out extension made. Not yet reinforced. The frame with the transfer support balls was made. Nine balls were screwed onto the frame. Scrap lumber was placed around the edges to bring up the height of the bench for the top. The right and left edges of the bench are at the final height needed. The right side wall was placed on. Why am I using all of this scrap lumber? Because I have so much of it and none of it will show anyways when I am done. A scrap piece of thin plywood then covered all of the pieces. The workbench is now ready for the final top after I finish working on the reinforcements for the roll out extension. I added some inside corner moulding on the frame and added some outside corner moulding along the edge of the plywood side on the right. 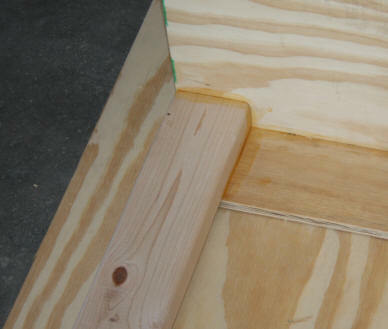 To reinforce the roll-out extension, I placed a 4" width of some scrap plywood along the front edge of the extension. I am gluing it first and will then run nails through it. This strip in the front will also help hide the transfer balls underneath. So it is also a trim for the table. Along the right and left edges where the roll out extension top will be, I added some thin polystyrene moulding. This moulding will help keep the extension straight when it is rolled in and out. The surface of this moulding is also very slick which will help the roll-out glide out smoothly. July 27, 2016 - With the shelves painted and in place, the moulding installed on the right side of the door, and the door knob put on.....the closet is basically finished. The wall will be installed after the cupboards are up. 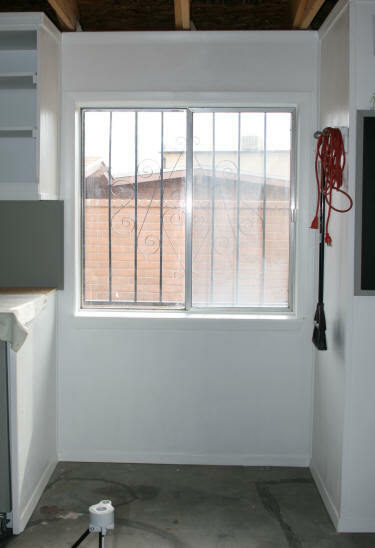 The French cleat wall part for the cupboards was made from some scrap 3/4" plywood and mounted on the wall. There were only two studs on this section of wall. The cleat was attached with two 2-1/2" screws in each stud. After making sure the roll out extension worked properly, I pulled it out and painted it. 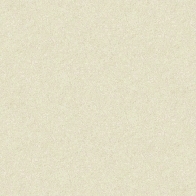 I decided to paint it gray to break-up the monotony of all the white. The gray also matches the wheels. After working with the roll out, I discovered that it was easier to leave the casters locked. To move the extension in and out, you lift it up on the end. Closet complete. Wall will be done after cupboards hung. With the roll out pushed in, I just nudge the caster in with my foot so it is in the recessed section. With the wheels unlocked, the legs kept popping out. Because it helps to lift up the edge of the roll out to move it, I left a gap between the main workbench top and the roll out. If I had placed moulding against the edge of the workbench top to cover the gap, I would not be able to lift up on the roll out. 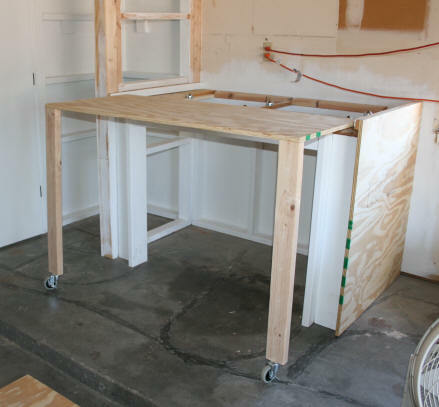 While the paint was drying on the roll out, the workbench top was put in place. To finish the edge of the workbench, I glued and nailed on a half round piece of moulding. 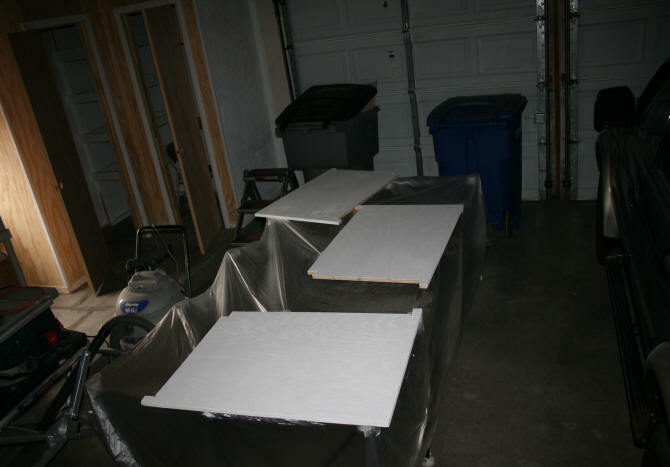 The workbench top will be painted with ebony Polyshade. This is a stain and polyurethane combo. Why black? Why not? 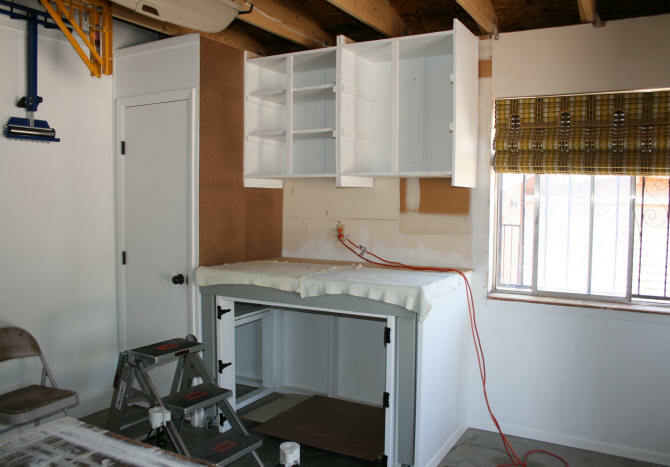 The top will be painted after the cupboards are installed. After the paint had dried on the roll out, It was moved back in place. I screwed in a couple pieces of metal plates underneath the roll out back to act as stops. If the roll out ever needs to be removed again, it is easily done by removing the screws that hold the metal. The doors for for the cabinet under the workbench will be hung with gate hinges. I had these on hand from my outdoor storage shed, so I decided to use them here. I went ahead and installed the hinges on the frame to get them out of the way. 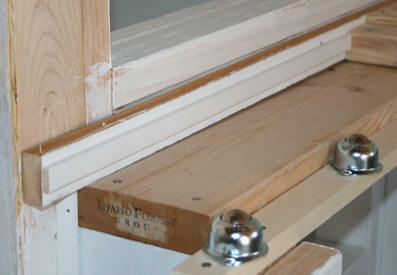 The base moulding I had removed from the wall was placed back on under the window and on the side of the workbench. The window was given some love. This window had not been opened in years because.... it would not open. After cleaning out all of the caked in dirt and moths. Yes, dead moths...I was finally able to open the window. I also pulled out the screen which needs to be replaced. I have ordered a new shade for the window to replace the retro 80's model on there now. The area under the window was painted. 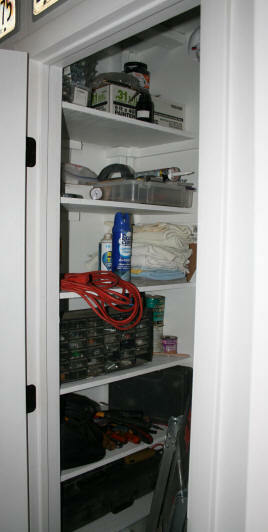 The area underneath, between the workbench and closet, I have decided to leave open. This way if I have something 8 feet long, it could be stored in here if needed. July 28, 2016 - Today was dado day. Made dados on both ends of side cabinet pieces. 8 dados making multiple passes on my table saw. I don't have a router. So yea, it took awhile. After the dados were made I made the basic cupboard boxes nailing and gluing the top and bottom sections into the dados. July 28, 2016 - I finished up the rest of the cabinets today. I added center supports in the front and back. Shelf supports were added to the inside. I placed thin Hardie board on the back of the cupboards and then painted everything that would be visible when hung. Before I finished for the day, I hung up the first cabinet to see if I could. These cabinets without the shelves are HEAVY. It is 3/4" plywood. 30" wide, 36" high and 18" deep. Standing on top of the workbench I had just enough strength to lift it up until the French cleat caught the back. My workbench has now been tested at 200+ lbs. The shelves were added after the cupboard was put in place. July 30, 2016 - First thing I did today was to hang the second cupboard. After I was done, I secured both cupboards in place to the wall with 2-1/2" screws into the studs. The French cleat is strong enough to hold the cupboards but I am not taking any chances. Both cupboards are not going anywhere at this point. I had enough of the thin Hardie board to place on the wall of the closet. Second cupboard put in place. Cupboards secured to studs with screws. Hardie board dry fitted on closet wall. Now let's make it pretty. Using a bunch of scrap moulding......wood, pvc, and polystyrene, I trimmed out the whole area above the workbench and around the cupboards. The wall areas were painted a flat gray. 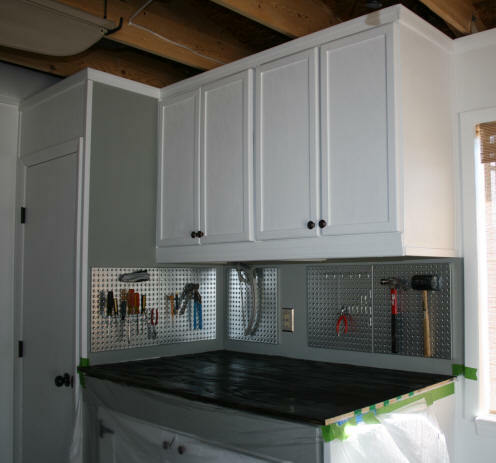 A new outlet plate was put on that will match the steel pegboards that will be installed on wall under cupboards. July 31, 2016 - Today was give more love to the window area day. The window area had several issues. The sides of the window opening were damaged. One way to fix it would have been to get some dry wall mix and apply it. Messy, messy. What I did instead, was to get some thin wood and nailed it on the sides. I had to make a notched area for the window latch. The window had never had any trim, so I added this around the window. I also gave the wood on the window sill a good sanding. After caulking every seam around the window, the whole area was painted. A scrap piece of of the window moulding was used to cover up the damage at the top of the wall. The new screen was also installed today. The window is now ready for its new shade which will arrive on Aug 3. 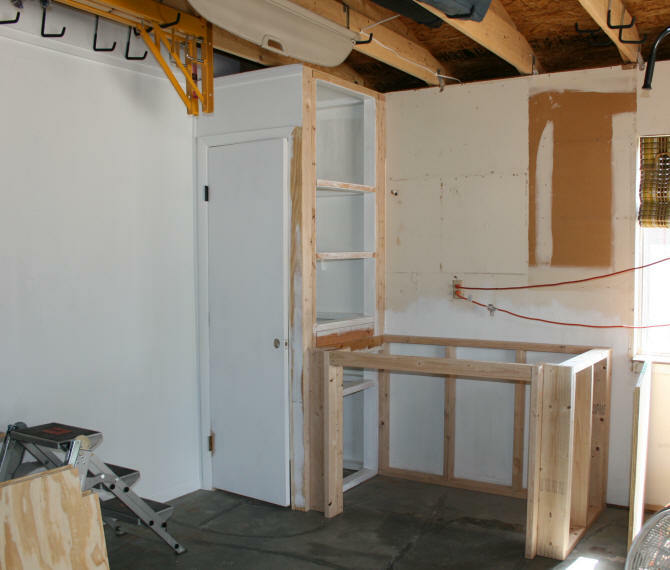 The only thing left for this area is the moulding on top of the workbench and the painting of the workbench top. 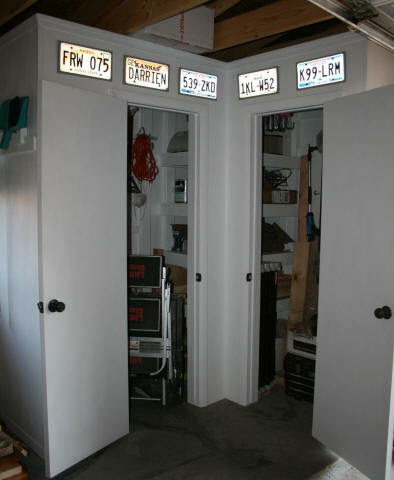 There are also the cupboard doors and the doors under the workbench. 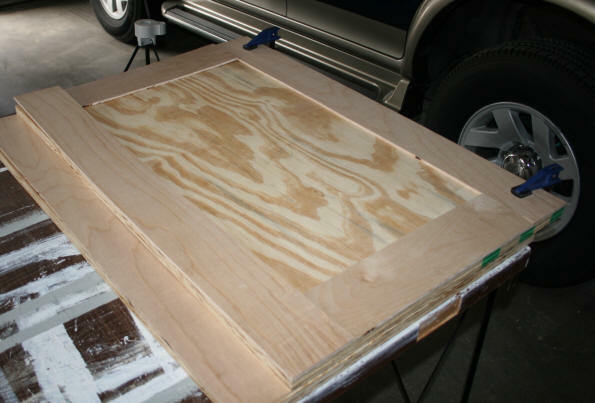 For the workbench cabinet, I am using the leftover wood I used to cover the damaged window opening sides. I cut strips a little under 4". It will be a simple shaker style gluing the wood pieces onto the front of the plywood. I don't have enough clamps, so this will take a while. August 3, 2016 - Almost done with the workbench area. 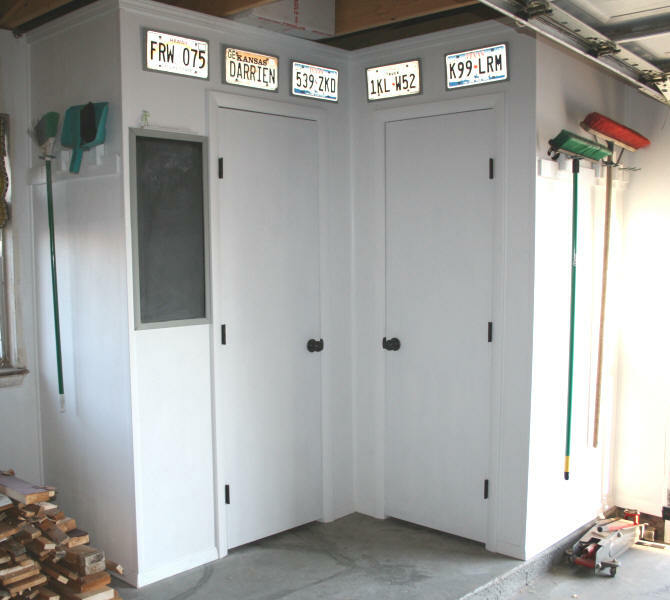 I finished the workbench cabinet doors and got them painted and hung. 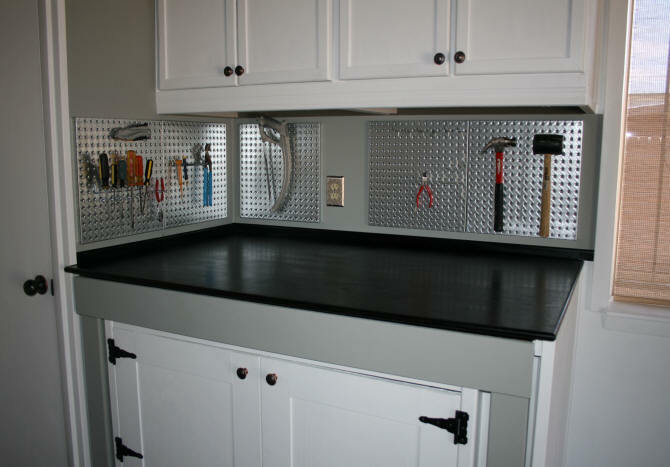 The steel pegboards came in and were mounted. The new "cheap" window shade came in. I ordered the cheapest window covering I could find. I would never hang this inside the house. For the garage it is perfect. I wanted something that would let in the daylight. But I wanted to block the view of the inside the the garage from the outside. 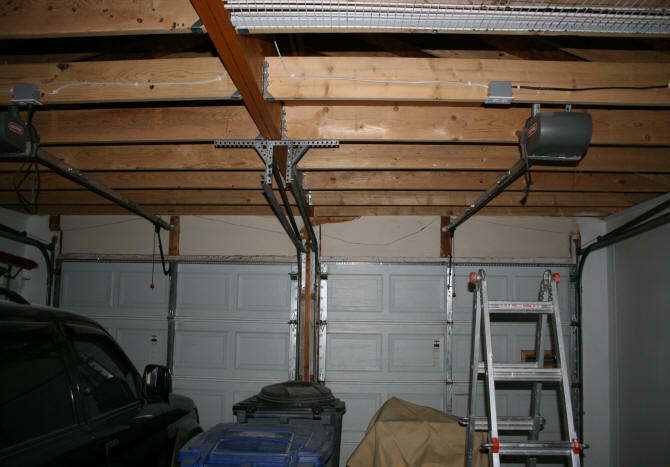 If there is no light on in the garage, you cannot see in. Workbench cabinet doors in place. Pegboard and new window shade installed. Cupboard door hinges installed. Cupboard door backs being painted in foreground. I finished working on the cupboard doors and I am currently painting them. 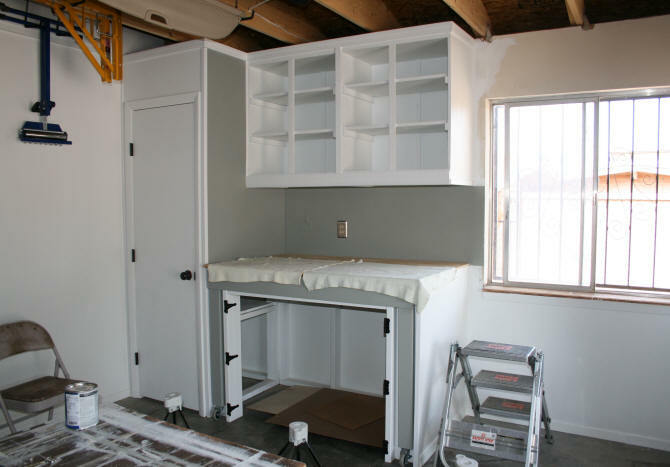 After the cupboard doors are hung, all that is left is the paint on the workbench surface. Snug as a bug in a rug, inside it's new home. August 5, 2016 - I spent yesterday installing the cupboard doors. Today I did all of the touch up painting and put on the cupboard knobs. The first coat of black paint went on the workbench top. The trim that goes along the edge of the workbench top is being painted separately. Whenever I have trim, that will be a different color than one of the surfaces it will lay against, I paint it before I install it. This way there is a clean line. Cupboard doors installed. First coat of black poly-stain applied to workbench top. Trim along top of workbench and along right edge, painted separately. I also don't have to worry about having to mask it, possible paint bleed, and tape taking off the paint underneath. I did put plastic under the workbench top to protect those painted surfaces. The poly-stain I am using is thin and I drip a bit. More so than when I am using a thicker latex paint. There will be three coats of the black paint. Sanding between each coat. After two coats, I will install the trim. The third coat will be done with the trim in place. The monsoon season has kicked in here which means, there is more humidity. I may need to wait additional days for each coat to dry before I can sand. In the meantime, I will order the lighting for this area. Can't have a work area without good lighting. There is currently no lighting over this area. August 6, 2016 - The black paint dried faster than I thought it would. I guess it helped to have a fan blowing on it. Anyways, I finished up the workbench. The third coat went on this afternoon and is drying as I type this. 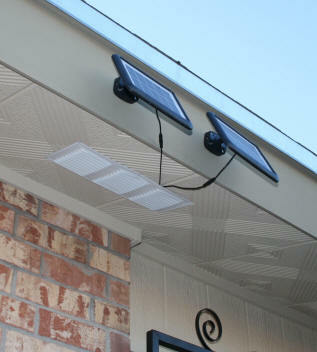 I have ordered one solar light to place over the work area. It will be the same light fixture I used in the L-shaped closet. I will have to run the wire out another soffit. The other light I bought was a 24" under cabinet LED light. It is a little pricey, but I was looking for one with the brightest output of light. Which means you need to spend a little more money. This one says it will give me an equivalent of 75 watts. It will plug in and not be hard wired. I wanted to get two lights, but I decided to wait until I see how the one works first. If I get a second light, it can be chained together. This way I only use one outlet plug. I will add a picture of the lights when I receive them and mount them. I added door sweeps to the bottom of the closet doors. This will help keep out some dust. I am also trying out some Lizard reflective tape along the cement ledge. I am wondering how long it will stick. If it does stick... good. If not, I will probably end up painting along the edge. So far neither my husband or I have fallen off or tripped on the ledge. Mentally, we know it's there. However, I have "almost" done so several times. With me, almost means eventually I will. Hopefully this marking along the edge will prevent this from happening. I still need to place the tape along the other edge. Completed side of garage, Reflective tape added to part of cement ledge. Door sweeps added to bottom of closet doors to keep out dust. - First grab the gray section in front with both hands on each side. 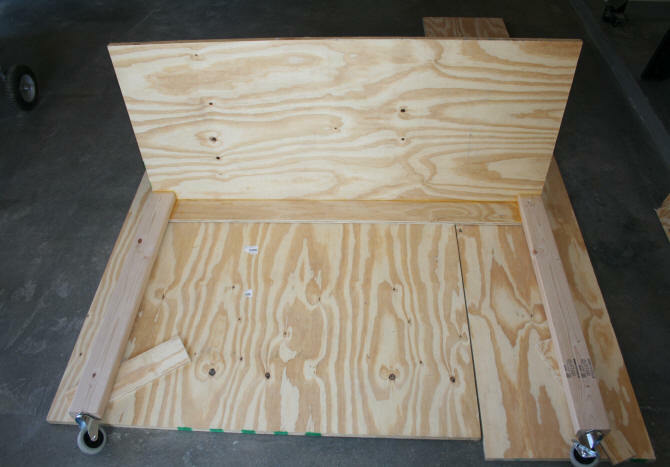 - Lift up a little to raise the locked wheels off the floor and pull out evenly a few inches. - Roll it out where you want it. - Roll the extension back in until you are a few inches from the bench. - Make sure the wheels are sticking straight out. - Lift the edge of the table and slide in until gray section is flush with the edge. - With foot, press on locked wheels a little to nudge them in pocket. In retrospect, I should have added drawer slides to the sides. I might do this later. For now the roll-out works fine. Workbench extension rolled out. To operate it, you grab the gray section in front with both hands and lift up a little and pull it out a few inches. Unlock the wheels. Roll it out, and then lock the wheels when you have it out where you want it. What is left to do in the garage? The other side. This is basically just painting. I will place before and after pictures on this page when I do it. 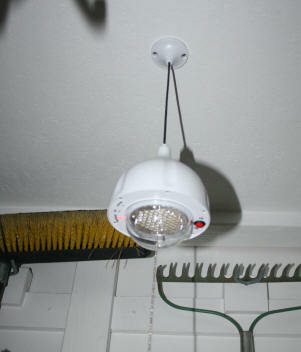 The overhead light is another solar light. The same as the the lights in the L-shaped closet. I installed the light away from the bench a little so it would also illuminate the inside of the closet at night. I also put a carpet type fabric over the workbench surface to protect it. 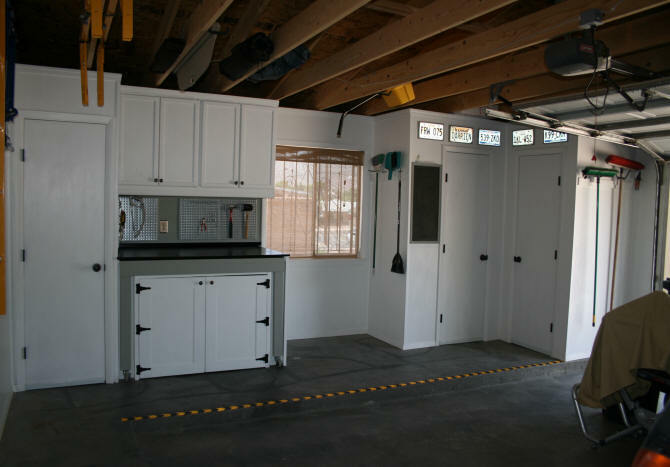 The same carpeting was placed on the garage floor around the workbench and closets. On the 12th, I started working on the east garage wall. I painted the new scrap moulding holder, placed moulding at the top of the wall to cover construction damage, repaired the damaged corner by the garage door opener frame, put a new outlet cover on, and installed a re-purposed bathroom hanging shelf as a "dis and dat" shelf. The corner by the garage door frame was heavily damaged by my open old pick-up door 15 years ago, while reversing out of the garage. Huh??? Don't know how the hell I did that, but I did. My husband had attempted to patch it. I sanded down the area then covered it with some scrap ABS I had. With the paint, it is almost unnoticeable now. Yes, that would be a piece of cardboard covering the garage door opener. I do this when I have the slide lock in place on the garage door. This reminds me to release this lock BEFORE operating the opener. If I forget and push the button, I run the risk of tearing up the frame. East wall garage after. Re-purposed bathroom shelf installed as a "dis and dat" shelf. The only wall area left to repair and paint is the wall above the garage doors. August 16, 2016 - Finished up the garage walls above the garage doors today. Also gave the inside of the garage doors a good cleaning. The only two things I have left to do in here is to do something about insulation and the slick cement floors. I will take a break for now. When I get around to doing either, I will update this page. The garage floors, in this garage, are pretty decent. There are no huge cracks and it is nice and level. However, the surface of the cement is like ice when it becomes wet. Even if you are wearing shoes with rubber soles. 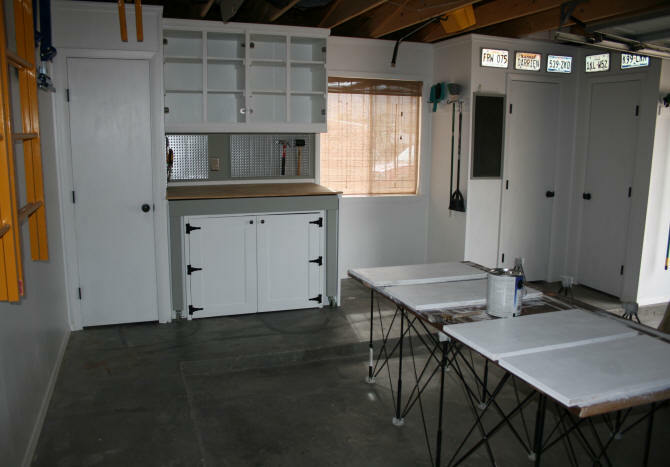 I thought about using one of those fancy garage floor paint kits to paint on a nice sparkly epoxy surface. The kits are not cheap. I would need more than one and they seemed like more of a hassle than it was worth, particularly for an old house. I just needed to do something about the slipping hazard so I don't slip and fall and break a hip. I decided on just a cover for the lower portion of the garage floor. My reasoning being, that if I was going to do something really messy in the garage, I could just roll-up the flooring to get it out of the way. If I painted on a nice epoxy coating, I would have to cover the garage floor every time I did something to keep it from getting soiled. 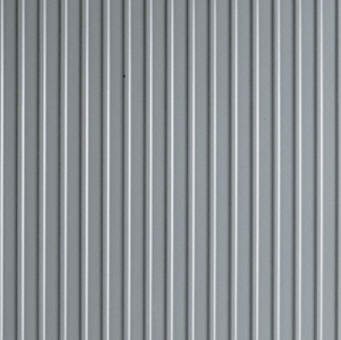 Gray Ribbed Pattern - G-Floor I decided on G-Floor Parking Pad by Better Life Technology. They have several patterns and colors. I went with the cheapest. Where ever you buy them, the gray ribbed pattern will usually be the cheapest option. There are also several sizes. I purchased the 7.5 x 17 foot mats. 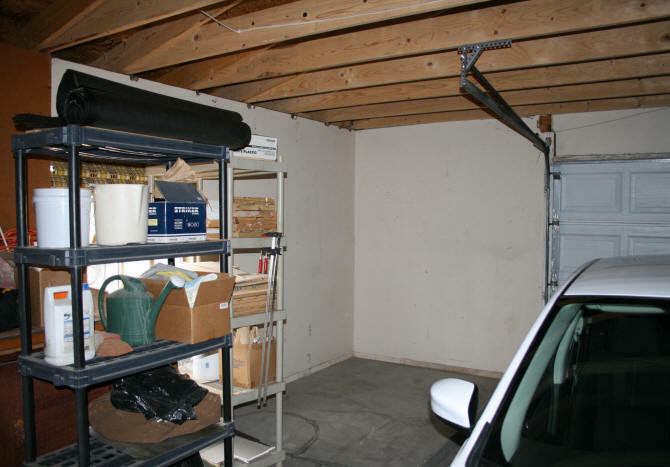 The lower floor of my garage measures 19 feet from side-to-side and 17 feet from the back to the garage openings. I needed to purchase three to cover my garage floor and I have a 42 inch by 17 foot piece left over. These mats are not cheap, you need to shop around. The big box hardware stores have the pads. So does Costco and Sam's Club. The cheapest place I found them was Wal-Mart. In fact, it was so much cheaper, $50-75 per pad, I had to look closely for the manufacturer part number to make sure I was in fact, getting the same thing. Oh, and the quirky thing about the Wal-Mart site, the price changed almost every day, when I was monitoring it. It went from $134 and dropped as low as $114. I bought it when it was around $125. Better than the Home Depot's $200. 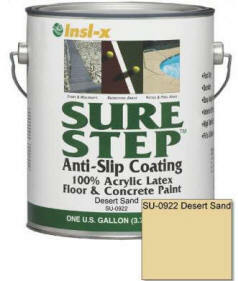 For the raised portion of the garage I used Sure Step Anti-Slip Coating (Desert Sand) made by Insl-x. 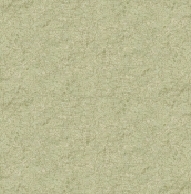 This paint has a sandy texture that will make any slippery floor not slippery. I used this paint before on the backyard sidewalks where we had the same issues with slippery concrete. It really does work, but keep muddy dog paws away from it. 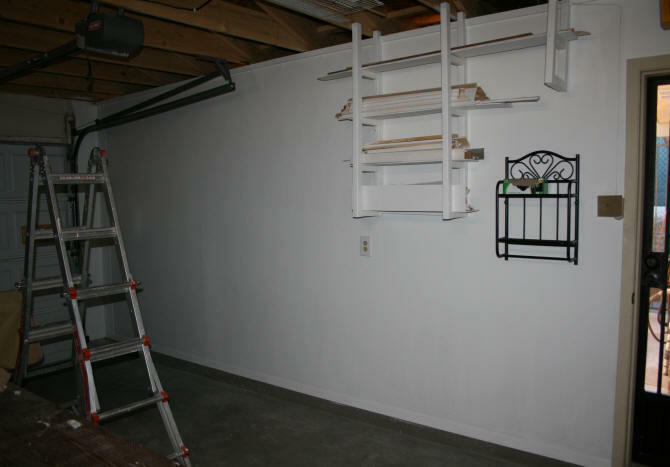 I used two coats on the ledge along the back wall. And one coat along the ledge along the window wall. I have some carpeting there, so I was not too concerned about the paint appearance. This paint looks better with at least two coats. I also painted the vertical side of the ledge. I had previously placed some black and yellow safety tape along the edge of the ledge to provide a visual aid to prevent tripping. Now, with a lighter color on the ledge, the ledge no longer needs to be safety taped. You can easily see the raised edge even in low lighting.